Every single minute, the world generates 1.7 million billion bytes of data, equal to 360,000 DVDs. How can our brain deal with increasingly big and complex datasets? EU researchers are developing an interactive system which not only presents data the way you like it, but also changes the presentation constantly in order to prevent brain overload. The project could enable students to study more efficiently or journalists to cross check sources more quickly. Several museums in Germany, the Netherlands, the UK and the United States have already showed interest in the new technology. Data is everywhere: it can either be created by people or generated by machines, such as sensors gathering climate information, satellite imagery, digital pictures and videos, purchase transaction records, GPS signals, etc. This information is a real gold mine. But it is also challenging: today’s datasets are so huge and complex to process that they require new ideas, tools and infrastructures. Researchers within CEEDs (@ceedsproject) are transposing big data into an interactive environment to allow the human mind to generate new ideas more efficiently. They have built what they are calling an eXperience Induction Machine (XIM) that uses virtual reality to enable a user to ‘step inside’ large datasets. This immersive multi-modal environment – located at Pompeu Fabra University in Barcelona – also contains a panoply of sensors which allows the system to present the information in the right way to the user, constantly tailored according to their reactions as they examine the data. 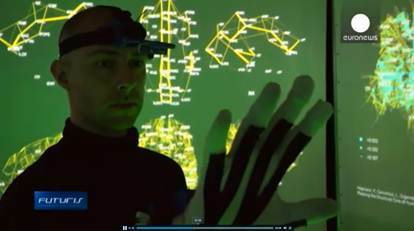 These reactions – such as gestures, eye movements or heart rate – are monitored by the system and used to adapt the way in which the data is presented. Neuroscientists were the first group the CEEDs researchers tried their machine on (BrainX3). It took the typically huge datasets generated in this scientific discipline and animated them with visual and sound displays. By providing subliminal clues, such as flashing arrows, the machine guided the neuroscientists to areas of the data that were potentially more interesting to each person. First pilots have already demonstrated the power of this approach in gaining new insights into the organisation of the brain. The CEEDs system can help with gathering and reacting to feedback from users in places as shops, museums, libraries and concerts. In the physical and virtual classrooms, professors could teach students more efficiently by adapting their presentations to their attention level. The CEEDs technology has been used for two years at the Bergen-Belsen memorial site in Germany and discussions are ongoing with museums in the Netherlands, the UK and the United States ahead of the 2015’s commemorations of the end of World War II. The project’s team is in discussion with several public, charity and commercial organisations to further customise a range of CEEDs systems to their needs. Applications discussed are related to a virtual retail store environment in an international airport and the visualisation of soil quality and climate in Africa in order to assist local farmers in optimising crop yields. EU action to take advantage of big data goes beyond research projects. The European Commission has recently called on national governments to wake-up to the big data revolution (press release) and is using the full range of policy and legal tools make the most of the data-driven economy (more information). Read more about the CEEDs project (also in French, German, Italian, Polish and Spanish).